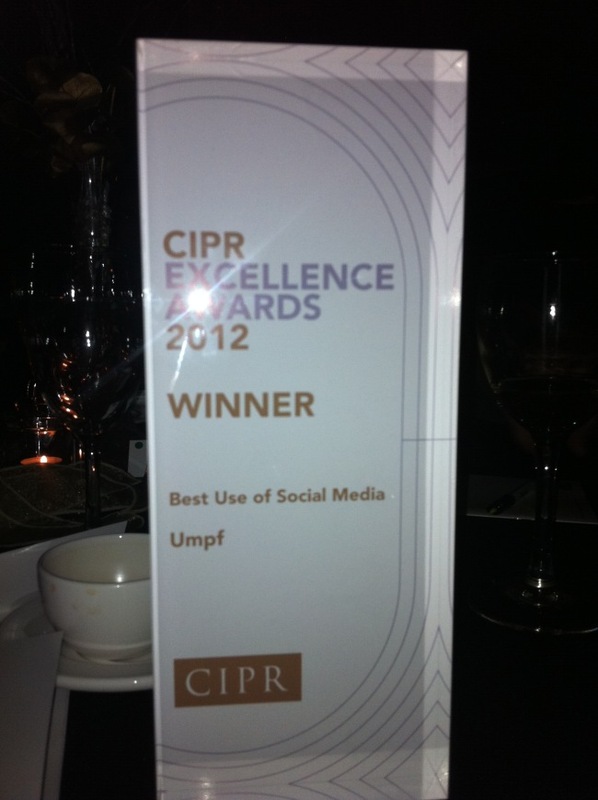 Another fantastic performance from the Umpf team last night as we won yet another award, the Best Social Media Campaign 2012 at the national CIPR Excellence Awards. Our campaign for ‘Tweet Pie: The World’s Shortest Recipe Book’ for client Belling, beat a stellar line-up of finalists competing in the category of best social media campaigns, including brands such as the Financial Times, Foot Locker, CrossCountry Trains, and Swiftcover.com. All the agencies represented in the category – Frank PR, Hotwire, McCann Manchester and, overall winners of the Outstanding Public Relations Consultancy award, Unity – are guys we respect and whose work we admire; making our win even more special. The CIPR Excellence awards, which score campaigns in areas including planning, creativity, measurement and evaluation, are widely regarded as the most credible in the PR profession. So to land a winner’s gong in such a hotly contested category so early on in Umpf’s history is an achievement we’re all proud of. 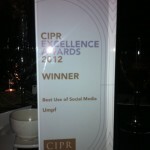 This latest award, handed out at event held at The Hilton Park Lane, London and attended by Lord Coe, caps an exceptional period for Umpf – it’s the tenth digital, PR and social media award we’ve landed in the last 12 months. Last year we were voted one of the Top Ten Social Media Agencies in the UK. For more fantastic examples of the best social media campaigns, see our annual list: the Social Media Campaigns Hall of Fame, here. Best Social Media Campaigns – Left-right: Robert Smyth, IoD; Louise Woodward and Adrian Johnson, Umpf; CIPR Excellence compere Colin Jackson.